Like a hand-held hall of fame, this set of guitar glasses has something for everyone in the band. Each pint glass sports an iconic guitar from a different genre of music, in classic colors that resonate with that instrument or era. Makes a great gift for your favorite music lover or air guitar aficionado. Glasses made and screen printed in the USA. Black and blue guitars looks like gray and red and orange looks like beige. Quality of the glass Is poor. You can see little bubbles and waves. Looks very cheap. I am very pleased by the quality of theses glasses. The colors match the photo, and they feel substantial. Look like a good, thick quality glass. Great for the guitar enthusiast! I bought these glasses for beer. They are a great addition to our bar. 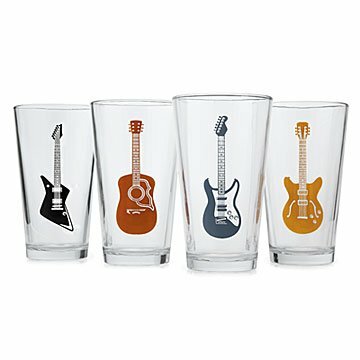 These pint glasses sport iconic, graphic guitars from different eras and genres of music.